Grasonville, Maryland is located in Queen Anne’s County and is just a short distance from the Chesapeake Bay Bridge. The housing options are very diverse to meet any real estate need you may have. You will find beautiful waterfront condos in amenity rich communities, starter homes and luxurious waterfront estates. There are a number of sought after communities located in Grasonville, MD. The Prospect Bay community and Country Club is a very popular neighborhood offering a pool, tennis, club house, restaurant and a championship 18 hole golf course all of this surrounded by beautiful water views. There are many other wonderful neighborhoods to choose from where you are sure to find the perfect home. 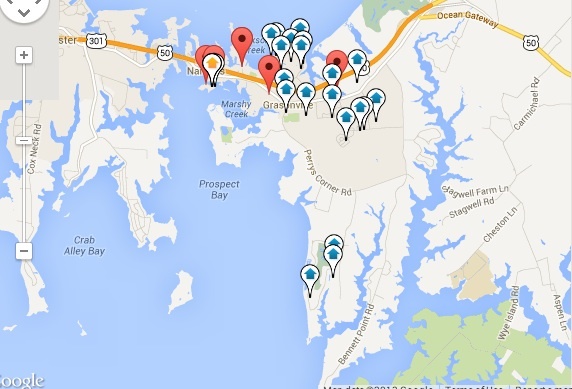 Grasonville is also where you will find the Chesapeake Bay Environmental Center. The Chesapeake Bay Environmental Center was originally founded to protect the wetlands for waterfowl. It has since expanded to address the issues of declining water quality, urban sprawl and habitat loss. Today they are the leader in testing and restoration techniques to benefit the entire Chesapeake Bay. It is a wonderful place to explore and learn with many community and children’s programs and events which will entertain you while also educating you about our Bay and environment.